Right guard Laurent Duvernay-Tardif is helped off the field after breaking his leg against the Jaguars. KANSAS CITY, Mo. — The Chiefs placed right guard Laurent Duvernay-Tardif and safety Armani Watts on injured reserve Tuesday and signed outside linebacker Frank Zombo to provide depth at that depleted position. Hardly the way to begin a week of preparation for a visit to New England. 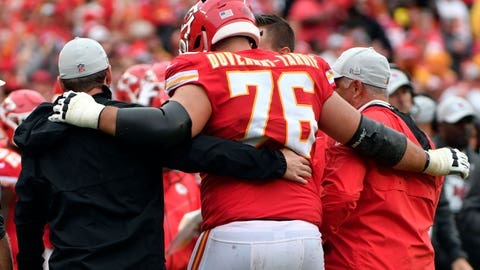 Duvernay-Tardif, who’s in the second year of a five-year, $42.36 million contract, broke a bone in his left leg with a few minutes left in Sunday’s 30-14 victory over Jacksonville. Jordan Devey replaced him for the rest of the game and is likely to start against the Patriots on Sunday night. The Chiefs already placed safety Daniel Sorensen on injured reserve with a designation to return in training camp. Teams are allowed to activate two players off IR each season. That means Watts likely had his promising rookie season cut short after hurting his groin against the Jaguars. The fourth-round pick out of Texas A&M has been used heavily after the injury to Sorensen and with fellow safety Eric Berry sidelined since the start of training camp with a troublesome heel. His best performance came two weeks ago in Denver, when Watts had his first career sack. The Chiefs have been surviving in the secondary with veteran Ron Parker, who signed just before the start of the season, anchoring a hodgepodge group of safeties. Eric Murray has been starting alongside him but left the game against Jacksonville with an injury to his lower leg. Jordan Lucas, who arrived in a trade with Miami a week before the start of the season, had played almost exclusively on special teams before Sunday. He wound up playing some important snaps against the Jaguars and picked off Blake Bortles for his first career interception. Depending on the health of Murray, he could get his shot to start in New England. There are even bigger questions at outside linebacker. Justin Houston was forced out of last week’s game with a hamstring injury, Tanoh Kpassagnon hurt his ankle and Dee Ford has been hobbled off and on much of the season. That forced Kansas City to use rookie Breeland Speaks late in the game, when the Jaguars were trying desperately to mount a comeback. It’s also why general manager Brett Veach reached out to Zombo, who spent the past five seasons with the Chiefs before getting cut in training camp. He’s versatile enough to play inside or outside, and his experience in defensive coordinator Bob Sutton’s system means he can be up to speed quickly.